Cade Brem McNown (born January 12, 1977) is a former American college and professional football player who was a quarterback in the National Football League (NFL) for four seasons. He played college football for the University of California, Los Angeles (UCLA), where he was recognized as an All-American. The Chicago Bears selected him in the first round of the 1999 NFL Draft, and he played professionally for the Bears, Miami Dolphins, and San Francisco 49ers of the NFL. 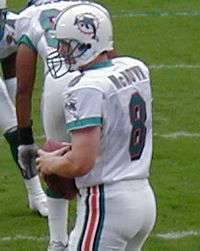 McNown attended UCLA, and played for the UCLA Bruins football team from 1995 to 1998. He became the starting quarterback as a true freshman, four games into the season, ranking first among all freshmen quarterbacks in many statistics. In 1995, UCLA finished 7–5 and played in the Aloha Bowl (losing to Kansas). For his career, McNown still holds many of the passing and total-offense records. McNown also holds the distinction of being the only UCLA quarterback to go 4-0 against cross-town rival USC. On October 9, 2009, McNown was inducted into the UCLA Athletics Hall of Fame. McNown would start his first game for the Bears on October 10 following a hamstring injury to Matthews the previous week. During the game on December 26, following a poor performance against the Rams, McNown chose to sit out the second half of the game. He would be replaced as starter by Jim Miller, but would again be named the starter following Miller's suspension. He would finish the season breaking franchise rookie records for completions and passing attempts. He was named the starter over Matthews (Miller was injured during the pre-season), but his performance grew noticeably worse through the season; the Bears under McNown would fall to 1–6, leading the home crowd to regularly chant for Miller's return. He suffered a shoulder injury during the seventh game of the season (against Philadelphia), was briefly replaced by Miller, who would himself suffer an injury and be replaced by Matthews. McNown would start (and lose) one more game that season, against San Francisco, and was benched for the final game of the season. McNown was charged in September 1999 with the illegal possession of a handicapped parking pass while playing football at UCLA in 1996, to which he pleaded no contest. Other players charged included Skip Hicks, Larry Atkins, and Brendon Ayanbadejo. McNown later worked for UBS in the private wealth group before joining JPMorgan Chase Private Bank. In 2013, Lourd Capital Management hired McNown as vice president. ↑ "Cade McNown". sports-reference.com. Sports Reference LLC. Retrieved September 3, 2016. ↑ "Cade McNown". nfldraftscout.com. Retrieved September 3, 2016. 1 2 Russell, Dalton (November 28, 2013). "Chicago Bears: Top Five Turkeys in Franchise History". Yahoo! Sports. Archived from the original on December 4, 2013. Retrieved November 28, 2013. ↑ "Cade McNown". pro-football-reference.com. Sports Reference LLC. Retrieved September 3, 2016. 1 2 "McNown, Hicks, Atkins charged". CNN Sports Illustrated. September 13, 1999. Archived from the original on December 19, 2013. ↑ "PLUS: COLLEGE FOOTBALL -- U.C.L.A. ; McNown Pleads No Contest". The New York Times. October 1, 1999. Archived from the original on May 27, 2015. ↑ "Cade McNown Joins Lourd Capital Management as Vice President". Yahoo! Finance. June 24, 2013. Retrieved January 28, 2014.